Home / APO Hiking Society / Jim Paredes / Jim Paredes Video / Pres. 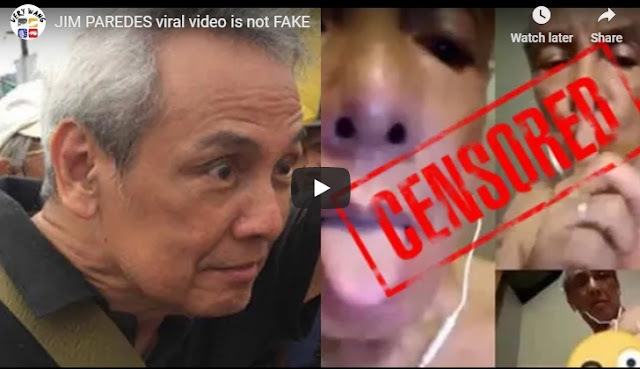 Rody Duterte / Viral Videos / Jim Paredes Finally Admits that He's the Man in the Viral Video "I am truly sorry"
Jim Paredes Finally Admits that He's the Man in the Viral Video "I am truly sorry"
Controversial celebrity and musician of the popular group APO Hiking Society, Jim Paredes finally admitted his mistake and said that he was indeed the man in the viral video which circulated on the internet. In an official statement released through the official website of Paredes, he addressed his fans and the netizens retracting his previous statements that that video was fake and it's not him. According to the explanations of Jim Paredes, the video was real. However, he doesn't want anyone to see it because it's private. He believed that his political beliefs and affiliations made someone to invade his privacy. Jim Paredes was quoted as saying "The video was real. It was private, and not meant for public consumption. I do not know how it became public. I can only surmise that in this ugly season of toxic politics, muckrakers determined to neutralize my influence by violating my privacy and digging up dirt on me are at work." Paredes said. The veteran singer and entertainer also shared that he's in panic on how he would deal with the problem after he saw the video being spread on social media by netizens, but later on, he decided to admit his wrongdoing instead of denying the issue. Jim Paredes also believed that the sin he committed is the "most human of all" and also admitted that he's "flawed person" and a "human being" like everyone else who also made some mistakes.